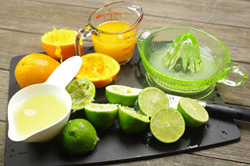 A combination of freshly squeezed lime and orange juice is the base of this bright and rustic-feeling dish. Look for limes with smooth skin that feel heavy for their size; both are good indicators that the limes are juicy. 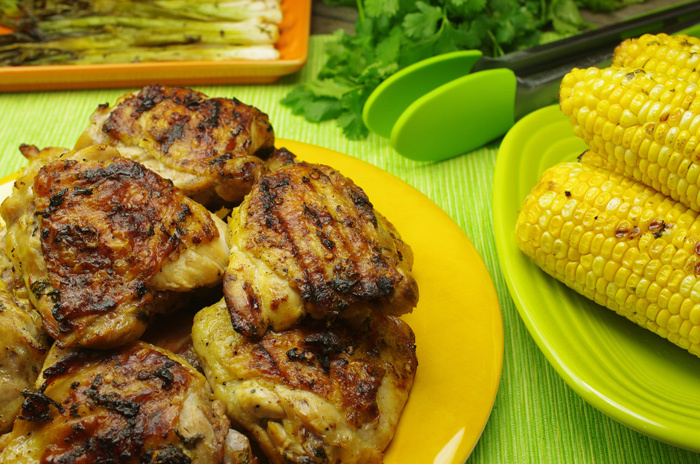 Serve the chicken on a large platter with the charred corn and scallions so guests can help themselves. 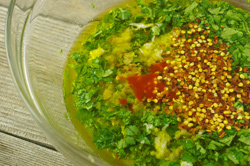 Whisk both juices, cilantro, 1/2 cup oil, garlic, red pepper flakes, and hot pepper sauce in a medium bowl. Season marinade to taste with salt and pepper. Place chicken thighs in a large resealable plastic bag. 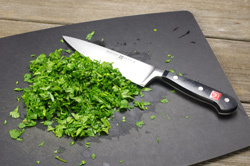 Place scallions and corn in 1 or 2 extra-large resealable plastic bags. 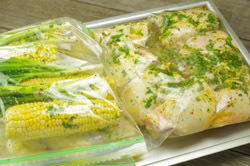 Divide marinade equally between bags; seal bags and turn chicken thighs and corn to coat. Chill chicken, corn, and scallions, turning bags occasionally, for 4 hours. Build a medium-low fire in a charcoal grill, or heat a gas grill to medium. Brush grill grate with oil. 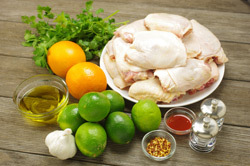 Remove chicken and vegetables from marinade; discard marinade. 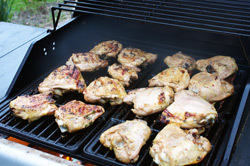 Grill chicken, turning occasionally and rearranging on the grill for even cooking, until charred and an instant-read thermometer inserted into the thickest part of the thigh registers 165°F, about 25 minutes. 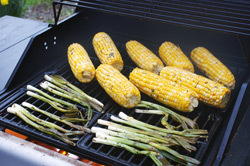 Grill scallions and corn until charred on all sides, about 6 minutes for scallions and 13 minutes for corn. Transfer chicken, scallions, and corn to a platter. Reprinted with permission from The Grilling Book: The Definitive Guide from Bon Appetit edited by Adam Rapoport. Copyright 2013. Published by Andrews McMeel Publishing, Inc., Kansas City, MO.